Traditional house of charm any comfort with swimming pool without vis-à-vis. For a relaxing holiday near the city without its disadvantages. 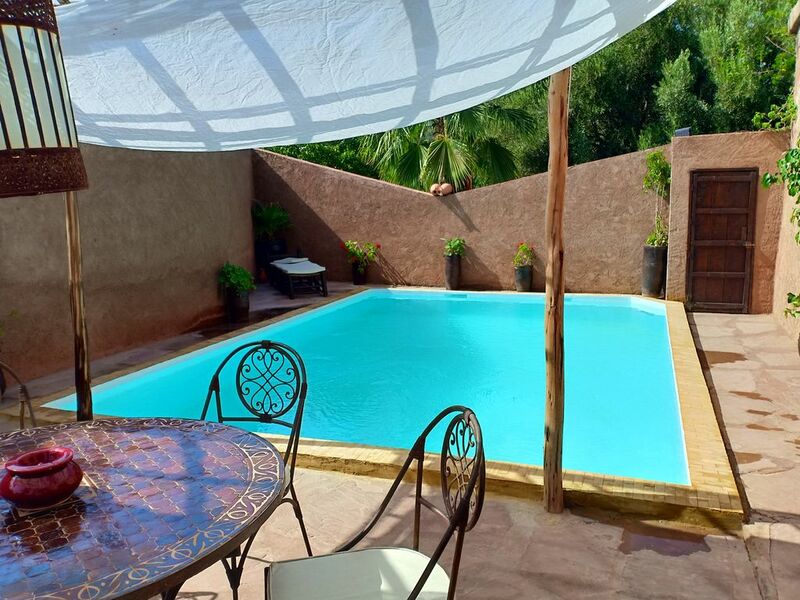 Dar Souiguia is a beautiful rural house with terrace, garden and pool, located on the outskirts of the urban area of ​​Marrakech, guarantee of a relaxing calm and a healthy and serene atmosphere. You will find all the benefits, climatic and human, of stays in Marrakech, without the disadvantages inherent in the center of this big city. You can enjoy a small supplement per day, a person to cook, cleaning the house is included in the rental rate. Assistance for shopping, and all advice for visits and activities is included with great pleasure in the rental. For the on-site activities available for free, there is the swimming pool, a 12-hole mini-golf course, a mini football pitch, a ping-pong table, badminton, a game of pétanque balls, archery, a bike-training, board games, a poker case, a library, a stereo, French TNT television and a DVD player with movies.